5.3 Ho's initiative to the U.S. However, during World War II, France was swiftly defeated by Nazi Germany, and colonial administration of French Indochina passed to the Vichy French government. The Vichy government ceded control of Hanoi and Saigon in 1940 to Japan, and in 1941, Japan extended its control over the whole of French Indochina. The U.S.A., concerned by this expansion, put embargos on exports of steel and oil to Japan. The desire to escape from these embargos and become resource self-sufficient ultimately led to Japan's decision to attack Western countries in December 1941; see Vietnam, war, and the United States . Indochinese Communists had set up hidden headquarters in 1941, but most of the Vietnamese resistance to Japan, France or both, including both communist and non-communist groups, remained based over the border, in China. As part of the Allied fighting against the Japanese, the Chinese formed a nationalist resistance movement, the Dong Minh Hoi (DMH); this included Communists, but which not was not controlled by them. When this did not provide the desired intelligence data, they released Ho Chi Minh from jail, and he returned to lead an underground centered around the Communist Viet Minh. This mission was assisted by Western intelligence agencies, including the U.S. Office of Strategic Services, the predecessor of the Central Intelligence Agency (CIA). Free French intelligence also tried to affect developments in the Vichy-Japanese collaboration. In March 1945, the Japanese imprisoned the Vichy French and took direct control of Vietnam until they were defeated by the Allies in August. At that point, there was an attempt to form a Provisional Government, but the French took back control of the country in 1946. Communists who indeed would like to expand. The lines were not always clear, and some alliances were of convenience. Prior to his death, Franklin D. Roosevelt made numerous comments about not wanting the French to regain control of Indochina. In 1999, former U.S. Secretary of Defense and architect of the U.S. involvement in Vietnam Robert McNamara wrote that both sides had missed opportunities. The U.S. had both ignored its own Office of Strategic Services (OSS) intelligence reports on Ho's nationalism, and failed, when the Truman Administration became suspicious he was merely a Soviet pawn, to probe the situation. He found U.S. claims unconvincing that China was a threat, given a millennium of Sino-Vietnamese enmity, as well as Dean Acheson's claim that the French "blackmailed" the U.S. into supporting them. On Ho's part, McNamara believes they misinterpreted the lack of U.S. response to be equivalent to enmity, and, allowed themselves to be blackmailed by the Soviets and Chinese. In France itself, an anti-fascist Popular Front, included the Center, Left, and Communists, stated a new policy for all French colonies, not just Indochina. A corresponding Indochinese Democratic Front formed. Throughout East and Southeast Asia, tensions had been building between 1937 and 1941, as Japan expanded into China. Franklin D. Roosevelt regarded this as an infringement on U.S. interests in China. The U.S. had already accepted an apology and indemnity for the Japanese bombing of the USS Panay, a gunboat on the Yangtze River in China. The appointment of Catroux, the first military governor general since civilian rule began in 1879, reflected the single greatest concern of the new government: defense of the homeland, defense of the empire. Catroux's immediate concern was with Japan, who were actively fighting in nearby China. After the defeat of France, with an armistice on June 22, 1940, roughly two-thirds of the country was put under direct German military control. The remaining part of southeast France, and the French colonies, were under a nominally independent government, headed by the First World War hero, Marshal Henri Petain, with its capital at Vichy. Japan, not yet allied with Germany until the signing of the Tripartite Pact in 1941, still asked for German help in stopping supplies going through Indochina to China. Catroux, who had first asked the U.K. for support, had no source of military assistance from outside France, stopped the trade to China to avoid further provoking the Japanese. A Japanese verification group, headed by MG Issaku Nishimura entered Indochina on June 25. Ducoux, on August 30, managed to get an agreement between the French Ambassador in Tokyo and the Japanese Foreign Minister, promising to respect Indochinese integrity in return for cooperation against China. Nishimura, on September 20, gave Ducoux an ultimatum: agree to the basing, or the 5th Division, known to be at the border, would enter. With the signing of the Tripartite Pact on September 27, 1940, creating the Axis of Germany, Japan, and Italy, Ducoux had new grounds for worry: the Germans could pressure the homeland to support their ally, Japan. Japan apologized for the Lam Song incident on October 5. Ducoux relieved the senior commanders he believed should have anticipated the attack, but also gave orders to hunt down the Lam Song deserters, as well as Viet Minh who had entered Indochina while the French seemed preoccupied with Japan. Roosevelt formalized aid to China in 1940 and 1941, President Franklin D. Roosevelt gave credits to the Chinese Government for the purchase of war supplies, as it put economic pressure on Japan. The United States was the main supplier of the oil, steel, iron, and other commodities needed by the Japanese military as it became bogged down by Chinese resistance but, in January, 1940, Japan abrogated the existing treaty of commerce with the United States. Although this did not lead to an immediate embargo, it meant that the Roosevelt Administration could now restrict the flow of military supplies into Japan and use this as leverage to force Japan to halt its aggression in China. After January 1940, the United States combined a strategy of increasing aid to China through larger credits and the Lend-Lease program with a gradual move towards an embargo on the trade of all militarily useful items with Japan. A contributing factor to the 1941 escalations by Japan, however, resulted when Japan expanded its position in Indochina. In February, 1941, Ho Chi Minh returned to Vietnam and established his base in a cave at Pac Bo in Cao Bang Province, near the Sino-Vietnamese border. In May, the Indochinese Communist Party convened its eighth plenum where it placed nationalist goals ahead of communist goals: it prioritized the independence of Vietnam ahead of leading the communist revolution, fomenting class war, or aiding the workers. To that end, the plenum established the "League for the Independence of Vietnam" (Viet Nam Doc Lap Dong Minh Hoi, Viet Minh for short). All Vietnamese political groups were welcomed to join the Viet Minh provided they supported ICP-led action against the Japanese and French colonizers. Ho Chi Minh's greatest accomplishment during this period was unifying urban nationalist groups with his own peasant communist rebels and creating a single anti-colonial independence movement. Vichy signed the Protocol Concerning Joint Defense and Joint Military Cooperation on July 29. This agreement defined the Franco-Japanese relationship for Indochina, until the Japanese abrogated it in March 1945. It gave the Japanese a total of eight airfields, allowed them to have more troops present, and to use the Indochinese financial system, in return for a fragile French autonomy. In late November, the United States told the Japanese that it must give up all occupied territories in Indochina and China, and withdraw from the Axis. Especially with U.S. MAGIC communications intelligence on the Japanese diplomatic correspondents, war seemed imminent. A "warning of a state of war" went to U.S. forces in the Pacific. 24,000 Japanese troops sailed, in December, from Indochina to Malaya. The Chinese organized the Dong Min Hoi (DMH) coalition to gain intelligence from Indochina, a coalition dominated by the VNQDD. The only actual assets in Indochina, however, were Viet Minh. Additional Chien Khu developed in Yen Bai Province, Thai Nguyen Province (the "traditional" stronghold of the PCI), Quang Ngai Province (Ho's birthplace), Pac Bo in Cao Bang Province, Ninh Binh Province and Dong Trieu in Quang Ninh Province. As did many revolutionary movements, part of building their base was providing "shadow government" services. They attacked landlords and moneylenders, as well as providing various useful services. They offered education, which contained substantial amounts of political indoctrination. They collected taxes, often in the form of food supplies, intelligence on enemy movement, and service as laborers rather than in money. They formed local militias, which provided trained individuals, but they were certainly willing to use violence against reluctant villagers. Gradually, they moved this system south, although not obtaining as much local support in Annam, and especially Cochin China. While later organizations would operate from Cambodia into the regions of South Vietnam that corresponded to Cochin China, this was well in the future. Some of their most important sympathizers included educated civil servants and soldiers, who provided clandestine human-source intelligence from their workplaces, as well as providing counterintelligence on French and Japanese plans. In August, Ho, while meeting with Chinese Communist Party officials, was held, for two years, by the Kuomintang. To make the Dong Minh Hoi an effective intelligence operation, the Chinese released Ho and put him in charge, replacing the previously Kuomintang-affiliated Vietnamese nationalist. The Japanese, on March 9, revoked the French administrative control and took them prisoner. This had the secondary effect of cutting off much Western intelligence about the Japanese in Indochina. They retained Bao Dai as a nominal leader. There would, however, continue to be a top French official, called High Commissioner rather than Governor General, but still in control. The five states, Annam, Cambodia, Cochin China, Laos, and Tonkin would continue; there would be no Vietnam. In August, Admiral Georges d'Argenlieu would be named as High Commissioner, with Gen. Jacque Leclerc as his military deputy. Ho's forces rescued an American pilot in March. Washington ordered Patti to do whatever was necessary to reestablish the intelligence flow, and the OSS mission was authorized to contact Ho. He asked to meet Gen. Claire Chennault, the U.S. air commander, and that was agreed, under the condition he did not ask for supplies or active support. His authority extended only to Tonkin and Annam; the Japanese simply replaced the former French officials in Cochin China; Cao Dai and Hoa Hao members also gained power there. entertained strong views on independence for French Indo-China. That French dependency stuck in his mind as having been the springboard for the Japanese attack on the Philippines, Malaya, and the Dutch East Indies. He could not but remember the devious conduct of the Vichy Government in granting Japan the right to station troops there, without any consultation with us but with an effort to make the world believe we approved. It should be observed that some of the anticommunists were indeed right: certain nations did become Communist. It is a separate matter whether Communism turned out to be the existential threat that it was believed at the time, but, again, hindsight is a luxury. During this period, France was perceived as more and more strategic to Western interests, and, both to strengthen it vis-a-vis the Soviet Union and Western Union, and against the perceived threat of Ho and the Chinese Communists, the U.S. would support French policy. Vietnamese nationalism or the discouragement of colonialism was really not a matter of consideration. This was a time of intense concern about Communism, not unreasonably just after the Berlin Blockade and during the Korean War. Nevertheless, the anticommunism sometimes grew very emotional, and this was exploited by Joseph McCarthy and others that U.S. politicians did not want to challenge. Laos, also a proto-state in the French Union, became of concern to the U.S. After the Japanese were removed from control of the Laotian parts of Indochina, three Lao princes created a movement to resist the return of French colonial rule. Within a few years, Souvanna Phouma returned and became prime minister of the colony. Souphanouvong, seeing the Viet Minh as his only potential ally against the French, announced, while in the Hanoi area, the formation of the "Land of Laos" organization, or Pathet Lao. Unquestionably, the Pathet Lao were Communist-affiliated. Nevertheless, they soon became a focus of U.S. concern, which, in the Truman and Eisenhower administrations, was more focused on anticommunism than any nationalist or anticolonialist movement. In contrast with other Asian colonies like India, Burma, the Philippines and Korea, Vietnam was not given its independence after the war. As in Indonesia (the Dutch East Indies), an indigenous rebellion demanded independence. While the Netherlands was too weak to resist the Indonesians, the French were strong enough to just barely hold on. As a result Ho and his Viet Minh launched a guerrilla campaign, using Communist China as a sanctuary when French pursuit became hot. Just after the Japanese surrender, before the Japanese-imprisoned French returned to their desks, Vietnamese guerrillas, under Ho Chi Minh, had seized power in Hanoi and shortly thereafter demanded and received the abdication of the apparent French puppet, Emperor Bao Dai. This would not be the last of Bao Dai. In August 1945, two three-man French teams, under COL Henri Cedile, the Commissioner for Cochin China, and MAJ Pierre Messmer, Commissioner for northern Indochina, parachuted, from U.S. aircraft, into Indochina. Reporting to High Commissioner d'Argenlieu, they were the first new French representatives. Cedile was almost immediately given to the Japanese. He was driven to Saigon, seminude, as a prisoner. Messmer was held by Vietnamese, and his team was given poison; one died before they escaped to China. Jean Sainteny later became the Commissioner for the north. These were the first of the officers who would replace the French officials that had worked under Vichy rule. High officers, such as Admiral Decoux, would be sent back to France and sometimes tried for collaboration, but Cedile and Sainteny generally kept the French lower-level staff. All men are created equal. The Creator has given us certain inalienable rights: the right to Life, the right to be Free, and the right to achieve Happiness...These immortal words are taken from the Declaration of Independence of the United States of America in 1776. In a larger sense, this means that: all the peoples of the world are equal; all the people have the right to live, to be happy, to be free. [turning to the Declaration of the French Revolution in 1791, "It also states Men are born, must be free, and have equal rights. These are undeniable truths. Ho's declaration had none but emotional impact; the French soon reestablished their authority after the Japanese surrendered. We have no way to know how much of this Ho believed, but it should be remembered as an example of how he understood the thinking of those who would become his enemy, while Lyndon Baines Johnson and Robert S. McNamara never seemed to grasp his beliefs in the willingness to accept protracted war and great losses, in the interest of eventual control. Cochin China, at this time, was far less organized than Tonkin. Cao Dai set up a state around Tay Ninh, while Hoa Hao declared one in the Can Tho area. These sects, along with a non-Viet Minh Trotskyite faction, formed the United National Front (UNF), which demonstrated on August 21. The Viet Minh, however, called for the UNF to accept its authority, else let the French to declare all Vietnamese nationalism a Japanese proxy, and the UNF tentatively accepted this on the 25th. The non-Communist nationalists became increasingly suspicious believing the Viet Minh Committee of the South was cooperating with COL Cedile. Mass demonstrations took place in Saigon on the 2nd, and shots were fired at it; the perpetrators were not identified. Through the OSS Patti mission, often through emissaries,  from the fall of 1945 to the fall of 1946, the United States received a series of communications from Ho Chi Minh depicting calamitous conditions in Vietnam, invoking the principles proclaimed in the Atlantic Charter and in the Charter of the United Nations, and pleading for U.S. recognition of the independence of the DRV, or — as a last resort — trusteeship for Vietnam under the United Nations. British and French troops landed in Saigon on September 12, with their commander, MG Douglas Gracey, arriving the next day. Gracey's headquarters instructed him, on the 13th, to exercise control only in limited areas, at French request, and after approval by the Southeast Asia [theater] Command under Field Marshal Sir William Slim. He was responsible for taking the Japanese surrender, and acting in temporary command of both British and French troops. On 21-22 September 1945, British Gurkhas, under , took the central prison back from the Japanese, releasing French paratroopers. Cedile, with those paratroopers, captured several Japanese-held police stations on the 22nd, and then took control of the administrative areas on the 23rd. Some Viet Minh guards were shot. French control was reasserted. Patti's guidance was that the U.S. had essentially given up the idea of a trusteeship, but still, at the U.N. foundation conferences, the U.S. was in favor of gradual independence. But while the U.S. took no action on Ho's requests, it was also unwilling to aid the French. President Franklin D. Roosevelt (in office 1933-45) detested French colonialism, but Harry S. Truman (in office 1945-53) was more interested in the French as an anticommunist ally, so he helped them to return in 1946. The Patti mission of the Office of Strategic Services (OSS was the predecessor to CIA) observed the situation from Kunming, China, starting in 1942, and then in French Indochina, including direct discussions with Ho Chi Minh. On March 2, the new Vietnamese Assembly met for the first time, under Ho; it had VNQDD and Dong Minh Hoi participation, but the Permanent Committee, which operated when the Assembly was not in session, was all Viet Minh. French Commissioner Sainteny, Ho Chi Minh, and Vu Hong Khanh of the VNQDD signed an agreement, on March 6, to recognized the Democratic Republic of Vietnam. The DRV, at this point, was to be a state within the French Union. Unification of Annam, Cochin China, and Tonkin was a matter to be decided. The DRV, in turn, agreed not to oppose French forces returning to Tonkin and Annam, to replace Chinese troops. Both Ho and Sainteny recognized it was a compromise. Ho said "I am not happy about it, for basically it is you that has won." Sainteny felt Ho was sincere in knowing he could not have everything at once; "this had been his plan for thirty-five years, he knew how to wait a little longer." Under a military annex, the occupation force would be limited to 15,000 Frenchmen and 10,000 Vietnamese, under French Command. This agreement, however, was only Sainteny's authority, and the French government never honored the provisions giving limited autonomy to the DRV. When details reached Washington, Ho's Communist ties were emphasized. move against Hanoi from the south. Just before the DRV delegation left for Paris, d'Argenlieu had recognized a "Free Republic of Cochin China". d'Argenlieu also created an autonomous region for Montagards, but only those of South Annam, who would be otherwise part of the DRV. Montagnards in Cambodia, Cochin China and Laos remained under the governments of their states. At Fontainebleau, d'Argenlieu played the Cochin China government against the DRV. He had a traditional picture of colonies in an empire, and expressed open distaste for the Vietnamese. The Vietnamese, knowing a French election would take place in the fall, saw the possibility of a looser arrangement, like the British Commonwealth coming into being if the Left won the election. Ho, on November 8, reconvened the National Assembly and obtained an approval of what had been agreed. Ho formed a cabinet of 7 Communists, 2 Democrats, 1 Socialist, 1 VNQDD, and one Independent. Ho failed to reach a temporary agreement between the French and the most intensely anti-French elements of the Indochinese Communist Party. As a result, The growing frequency of clashes between French and Vietnamese forces in Haiphong led to a French naval bombardment in November 1946, killing from 6,000 to 20,000. This incident and the arrival of 1,000 troops of the French Foreign Legion in central and northern Vietnam in early December convinced the communists, including Ho, that they should prepare for war. Marius Moutet, Minister of Overseas France, later said there would have been few surviving Frenchmen in Hanoi had there not been an agreement with the Viet Minh. Moutet had, in 1936, also been minister for the colonies and espoused real change. Meanwhile, in the U.S., Secretary of State Dean Acheson advised a representative in Hanoi, "Keep in mind Ho's record as clear agent international communism." The Soviet Union, however, was not to recognize the DRV for several years. The same guidance, however, observed "d’Argenlieu's usefulness impaired by outspoken dislike Vietnam officials and replacement perhaps desirable". It must never be forgotten that France had strong leftist and Communist internals, not always agreeing with one another and certainly not with the various Indochinese groups. Nevertheless, politics inside France definitely affected Indochina. At this time, the French still saw Bao Dai as a key part of the solution. In January, U.S. Ambassador to France Jefferson Caffery had been instructed to empathize with the French, use the "good offices" of the U.S. to help settle the Indochinese situation, and sell the French arms for use anywhere except Indochina. In February, he was told to tell the French that the U.S. felt colonies were "outmoded", but the U.S. was aware that Ho had "direct Communist connections" and did not want to see colonial administrations replaced by philosophy and political organizations emanating from and controlled by [sic] Kremlin." By May, however, the U.S. was giving conflicting instructions that while it supported Vietnamese nationalism, it could not support Ho, the apparent nationalist but Communist leaders. The U.S. compromise choice was Bao Dai, which meant, effectively, supporting the French. By late January, the French had retaken most of the provincial capitals in northern and central Vietnam; the Viet Minh stayed in the countryside rather than confront the French on terms favorable to the French. They continued to control most of the rural areas, concentrating on building up its military strength and setting up guerrilla training programs in "liberated" areas. Seizing the initiative, however, the French marched north to the Chinese border in the autumn of 1947, inflicting heavy casualties on the Viet Minh and retaking much of the Viet Bac region. Our objective is clear: to transpose to the field of Vietnamese domestic politics the quarrel we have with the Viet Minh, and to involve ourselves as little as possible in the campaigns and reprisals which ought to be the work of the native adversaries of that party. Indochina policy was the heart of debate, during March, in the French National Assembly, with the Communists walking out on three occasions. A Radical Socialist, not a member of the Right, accused the (Communist) Third International of provoking Indochinese nationalism as a means to Soviet imperialism. 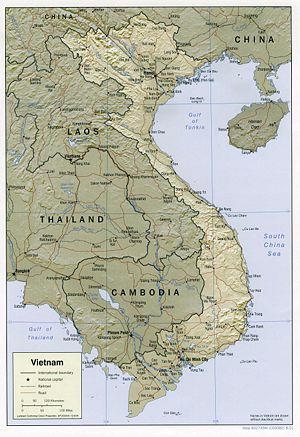 Ho's initiative to the U.S.
By March 1947, the Viet Minh had been driven out of the cities by the French, and were in rural hideouts such as Thai Nguyen Province. While the Democratic Republic of Vietnam (DRV) under Ho had provided some services in 1945 and 1946, it was reduced, at this point, to guerrilla status. Beginning in April, representatives of Ho Chi Minh, based in Thailand and led by Pham Ngoc Thach, deputy minister in Ho's personal Office of the President, made various proposals to U.S. representatives such as LTC William Law, Assistant Military Attache in Bangkok. These included recognition of Ho's DRV, mediation with the French, requests for American investment and economic concessions, and cultural and technical exchanges. While the efforts did not produce results, they did lead to an examination, inside the Truman Administration, of U.S. policy toward French Indochina. The critical issue was the extent to which the Vietnamese were Soviet-dominated; if they were, then it was deemed appropriate to support the French as part of overall actions against Communism. There was a brief period of increased negotiations between Thach and vice-consul James O'Sullivan in late April and early May, during which U.S. Secretary of State George C. Marshall tentatively approved discussions at a higher level. By March 7, however, Marshall withdrew permission, based on reports from American diplomats in China, as well as those that dealt with the Chinese consuls general in Hanoi and Saigon. The U.S. Ambassador to China, John L. Stuart, a Kuomintang supporter, said that the Chinese had given up territorial ambitions in Indochina, and were supporting French policy. In May, 1947, Minister of War Coste-Floret announced in Paris that: "There is no military problem any longer in Indochina . . . the success of French arms is complete." Within six months, though ambitious armored, amphibious, and airborne drives had plunged into the northern mountains and along the Annam coast, Viet Minh sabotage and raids along lines of communication had mounted steadily, and Paris had come to realize that France had lost the military initiative. In the meantime, the French tried equally ambitious and equally unproductive political appeals. This page was last modified 07:56, 5 October 2013.